Grow-it-yourself gardening is not easy, but if you’re feeling ambitious, it’s a great way to take charge of your crops. EVERY PLANT in your garden has to come from somewhere, and for most home vegetable gardeners, that “somewhere” is either a seed in a packet or a transplant tray in a garden center. For the ambitious and curious few, there’s a third way to populate a backyard vegetable patch: growing your own transplants at home. A home nursery gives you the option to explore varieties that are not available from garden centers, and gives you total control over how and when your baby plants are grown. Home transplant production is not, however, for the faint of heart. A slapdash propagation space is almost guaranteed to result in stressed crops and a stressed gardener. But with the right approach and some attention to detail, an in-home propagation area can be easy to set up, and highly productive. In fact, you can grow hundreds of transplants in a few square feet. A small propagation area with one or two grow lights should provide more than enough room to grow all the transplants needed for a home garden. When setting up your propagation space, remember that you’re growing plants in an artificial environment. This makes them even more reliant on your care to thrive. You might be able to leave your outdoor garden to its own devices for days at a time, but a home vegetable nursery absolutely requires daily care. 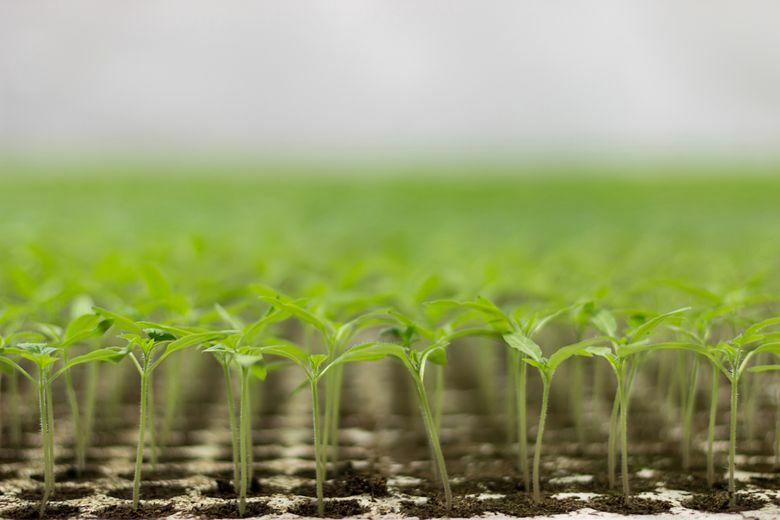 Light: In a typical home, sufficient natural light is rarely available for vegetable seedlings. Even if you have a large south-facing window, your plants will be much more successful with supplemental lighting. Light-stressed plants develop thin, weak, “leggy” stems and are more susceptible to pest and disease attacks. 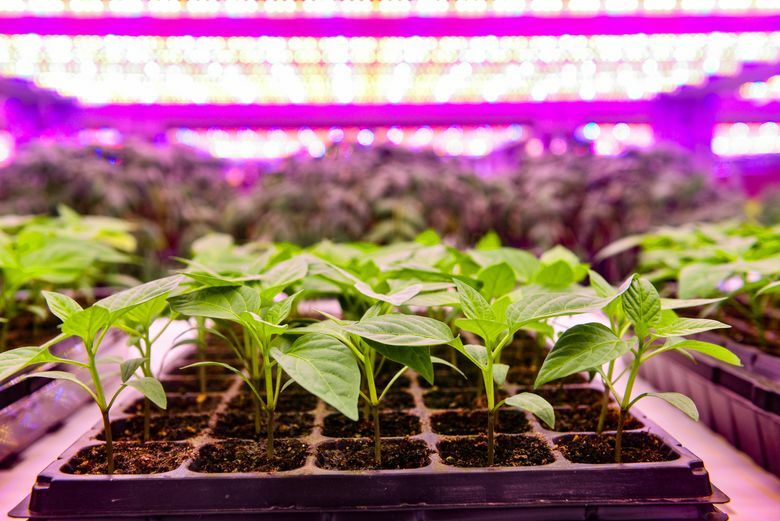 Most vegetable transplants grow best when provided with 12 hours of continuous, supplemental light per day. 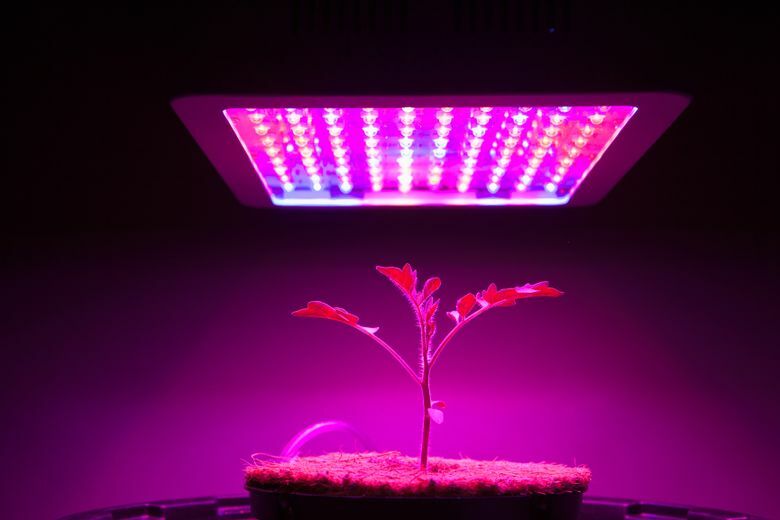 The intensity of growing lights varies widely. The lower the intensity of the bulb, the closer it should be to the plants. With the right setup, any full-spectrum light (metal halide, fluorescent or LED) should work for propagating transplants. Heat: If your propagation area is inside the house, you probably won’t need an additional heat source. However, if you are setting up the nursery in an unheated garage, atrium or greenhouse, your plants will need a source of heat to germinate and grow. You have two options: Heat the entire space, or heat just the area directly below the seeds. While a small space can easily be warmed up with a space heater, in larger rooms it might be more energy-efficient to use a heat mat. Heat mats are available in various sizes, and are perfect for a small nursery. We all know that electricity and water don’t mix, so be very careful when using an electric appliance in your propagation space! Water: A propagation area will always be a little messy. Make sure to protect any carpet, hardwood flooring or other delicate material in the area. Most seeds are planted very shallowly, so use a gentle stream of overhead water, or bottom-water your flats. Because of the limited soil volume and shallowness of the containers, transplants dry out very quickly. Check moisture at least once a day, and more frequently in hot, sunny weather. The soil should remain evenly moist until the plants have sprouted. Once plants have emerged, allowing the soil’s surface to dry out a bit between waterings will reduce pest and disease issues. Containers: Plants can be propagated in open flats, plug trays, soil blocks or recycled containers such as egg cartons and yogurt cups. If you’re using nonstandard containers (meaning anything that wasn’t designed specifically for growing seedlings), make sure to poke drain holes in the bottom. Place several seeds in every cell to make the best use of your limited space, then thin to the healthiest plant once sprouted. As a general rule, always seed at least 20 percent more than you plan to use in the garden. This will account for unhealthy seedlings and unforeseen disasters. 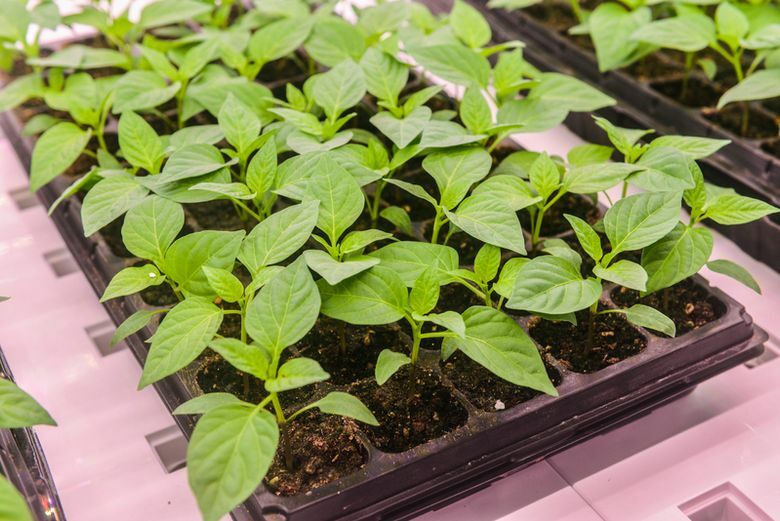 Potting up seedlings into larger containers, such as 4-inch pots or gallons, might be necessary for cold-sensitive crops like tomatoes and peppers that need to live in the nursery for an extended period. Soil media: It’s easiest to propagate in germination mix, a finely screened, lightweight medium. The soil’s small particles make it easy for young seedlings to push up through the mixture without being damaged or trapped under a large piece of bark or other substrate in a standard potting mix. As your plants mature, they’ll require more nutrients than a germination mix can provide, which will require you to move them into the garden or pot them up. If you pot up your young transplants to larger containers, use a nutrient-rich, all-purpose potting soil. Fertilizer: When plants germinate, they have a small stock of nutrients that enables them to become established. However, once sprouted, plants need quick access to additional nutrients. Because propagation containers are shallow and require frequent watering, nutrients leach more quickly than they do in the garden. Frequent, low doses of soluble fertilizer will help your transplants thrive. Keep in mind that over-fertilization can lead to salt buildup or fungal growth, so finding the right dosage and fertilizing schedule is imperative. Pest and disease control: An invasion of insect pests is a real possibility when growing transplants in your home. Keeping your space clean and well-ventilated will reduce or eliminate problems. If pests arise, temporarily move the plants outside (weather permitting), and wipe down all surfaces with alcohol, bleach or hydrogen peroxide. Sticky traps will help keep persistent insect populations under control. Once plants have sprouted, allow the soil surface to dry out between waterings; this will reduce insect breeding and fungal growth. Labeling: Label your trays! The importance of plant labeling can’t be overstated. It’s often virtually impossible to distinguish among different varieties of a crop when plants are young. When seeding an entire flat with a single variety, use at least two tags (in case one falls out). When seeding multiple varieties together in a flat, place a tag in each row or each individual cell. The tags then can move with the plants directly into the garden. If home propagation sounds like your cup of tea, this is a great time to begin building out your home nursery. Allow yourself three or four weeks for ordering supplies and setting up your space, and you’ll be ready to go in early March, when it’s time to start this year’s summer crop transplants.